The UK music industry has won a landmark court case in its fight against illegal online music sharing. 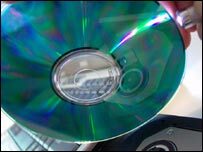 High Court judges ordered two men to pay the British Phonographic Industry between £1,500 and £5,000 for making thousands of songs available online. One of the men said he did not know he was acting illegally. The other said there was no evidence against him. The BPI has launched 139 similar cases since October 2004, most being settled out of court for up to £6,500. The two men, who the BPI decided not to name in publicising the cases, were accused along with three others of using peer-to-peer software to share 8,906 songs over the internet. The cases, in which both men were ordered to stop sharing files illegally, were the first of their kind to be heard in the British courts. Cases are pending against the other three people, who also refused to settle with the BPI. The first defendant, from King's Lynn, said the BPI had no direct evidence of infringement, but the judges dismissed this and ordered him to make an immediate payment of £5,000. His total costs are estimated at £13,500 and damages are expected to take the bill even higher. The other man, a postman from Brighton, said he was unaware that what he was doing was illegal and did not seek to gain financially. His case was also thrown out, with Judge Justice Lawrence Collins declaring: "Ignorance is not a defence". The postman, who is a father of two, was ordered to make an immediate payment of £1,500, pending final determination of costs and damages. A further 51 illegal file-sharers have been given a deadline of 31 January to settle cases and avoid court action. The BPI says it believes internet music-swapping has led to a decline in sales of singles since 1999. The organisation's lawyers called the decision a "massive step forward" for the industry's fight against illegal file-sharing. BPI chairman Peter Jamieson said illegal music-swappers were "stealing the future of artists and the people who invest in them".